This week's theme is Build a Home. Our 4-5 year old group gathers each day to play with clay and drawing. Last week's theme was "Game On," and clay tic-tac-toe tiles were created. Another group created "Super Kid," last week, seen below, which will be placed along the Pinellas Trail next to the Historic Train Station that serves as our Center for Clay. Week 7 Center for Clay camp continued --- more pictures! Today at the Center for Clay, we have a group from the Happy Workers Day Care Center in the new 4-5 year old group. The kids worked in collaborative projects, 2 giant butterflies to paint and hang in the window. In 2 groups, the kids each had their brush and water color paints. The teacher showed them how to dilute the paint, make big and small brush strokes and wash the brush...They all worked together very well, helping each other with color choices, shown how to clean the brush, they asked questions about the process. They asked for clean water for their rinse cup. They switched hands to reach other areas to paint. They laughed and had pride in their project. It was a very happy process start to finish. After each butterfly was done they were able to paint on smaller paper and learned about a wax resist process with crayons and water colors. They complimented each other, usually the person sitting next to them. Week 8 is coming next week and the theme will be Build a Home for the older groups. There are no formal themes for ages 4-5....the only suggestions are to have fun and make art! Our Director of Photography Beth Reynolds spent some time with the little ones this week at the Center for Clay. Here is a partial posting of her impressions from Clay Camp. "Today was really nice - they were making star fish and jelly fish -- the jelly fish was balled up tinfoil with netting wrapped around and then tons of ribbons tied around to drape down -- several kids did not know how to tie -- I showed one girl -- demoed it twice and she caught on right away and practiced her new skill. Other girls helped each other with the ribbon and once we showed them how to do it -- they were good to go -- the young man in class is very young and he was quiet, got extra attention and did proceed with making stuff." 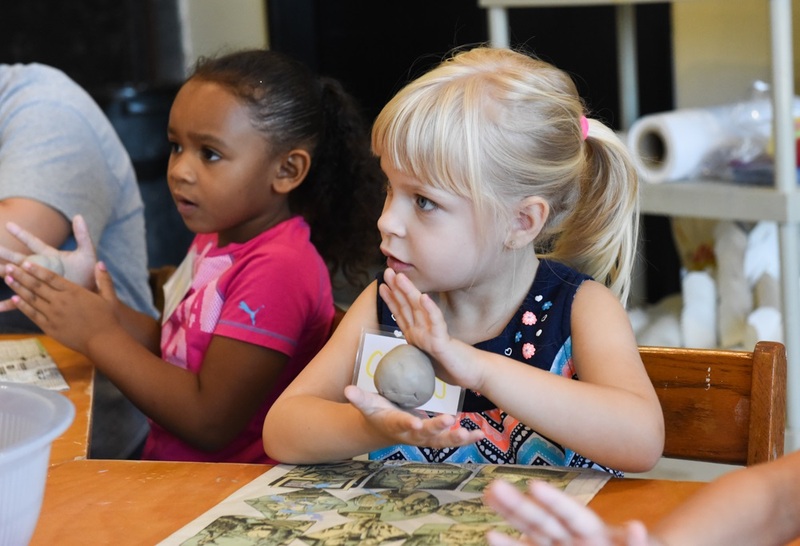 The kids this week were more attentive, but also not shy -- they talked and seemed to share well..."
Next week, our themes are Portraits in Clay and Game On, but our ages 4-5 youth don't work within the themes but have different projects every day, some that incorporate clay. Week 5 - America the Beautiful! 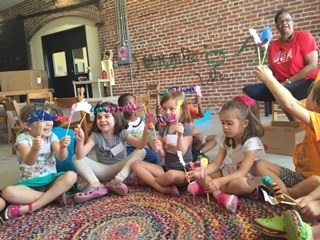 Campers utilized many materials to craft works of art that incorporated recycled objects and the theme of America the Beautiful. 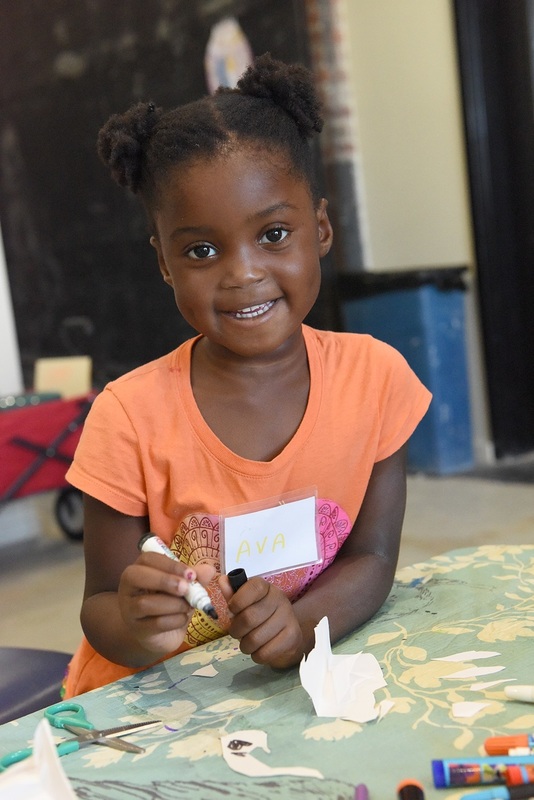 While a short week (July 4 was a holiday for camp, too), campers were ready and eager to get back into art-making action. Next week our theme will be In a Galaxy, Far, Far Away! Week 4 - This week's theme at Clay Camp is Super Heroes! 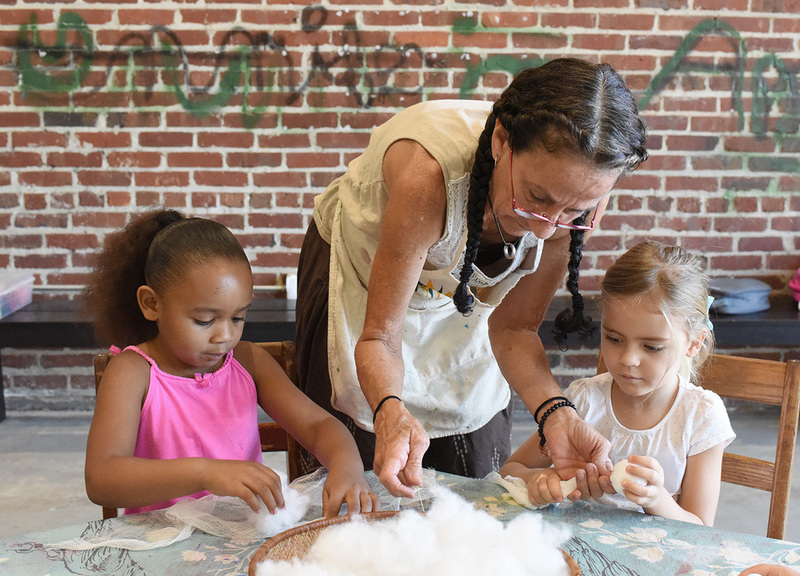 Artist/teacher Yarrow Ries works with campers ages 4-5 on art-making projects during"circle time." Today we had little ones ages 4-5 from the Happy Workers Center. This morning's group had clay to hold, shape, mold and pinch. We have happy campers here at the Center for Clay! Fish Sticks was the theme for the week and campers of all ages made fish-shaped objects for a variety of uses. Today they take their creations home to parents and show off their creative skills to friends. Next week's theme is Film Fest! We're so excited to have 4-5 years olds in our Summer Arts Camps this year, thanks to the Rapid Returns Creative Pinellas Grants! 2016 Summer Camps - By adding a new special half day camp for ages 4-5 and using additional space at the center, the grant will permit the summer camp to broaden its reach for a more enriching experience for youth.